Alena Telford: Gray Matter by David Levy, M.D. 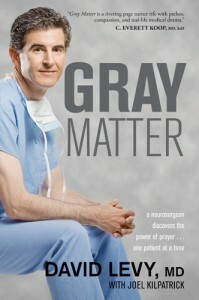 Gray Matter by David Levy, M.D. Gray Matter is a spiritual journey through the human brain setting precedent into a new realm of medical recovery, using many personal insights into the realm of humanity through science and prayer. Dr. Levy feels at the top of his game, he is a perfectionist who can do no wrong and being such, he feels he is not giving his all to his patients and begins to entertain thoughts of introducing prayer to his patients. Tentatively at first, he approaches prayer like it were a disease even though his motives are true, he is overcome with feelings of misgivings as he worries about his career and his reputation if word were to leak that he helped treat his patients with prayer. However, as he gains confidence in this new approach and sees how it can actually change an outcome for the better, he throws caution to the wind and he finds that he is not ostracized and shares God with any of those who may ask. All is not a steady journey however, David's faith is tested many times throughout the course of his spiritual awakening and after a very devastating event occurs with one of his patient's, he's not sure if he has the strength to hold himself up, let alone those of the family. With skill and patience and prayer, David is able to overcome all obstacles and stand united before God. If your at all queasy reading surgical procedures then steer clear of this book, everything is explained in graphic detail from the simplest procedures to the most complex. I was squeamish a few times and had to set it aside for a while. I liked Dr. Levy's human side, his worry, even though he is a neurological surgeon, he has fears and worries just like everyone else and I enjoyed seeing that human approach. I like the follow up stories that Dr. Levy shared throughout the story and how prayer had worked for them and their lives. I felt though that David was a bit stiff in his approach, and would've seen him loosen up over time, but with his high-end line of work, I am sure relaxation is something hard sought for, even with the best of intentions. I recommend this to anyone about to have a major operation and looking for spiritual guidance, as well as anyone who enjoys spiritual stories in which prayer is used as a healing purpose. A perfect blend of medical drama and spiritual insight, Dr. Levy’s musings on what successful and unsuccessful surgical results imply about God, faith, and the power of prayer are honest and insightful. As we watch him come to his ultimate conclusion that no matter what the results of the procedure are, “God is good,” we cannot help but be truly moved and inspired.